For outdoor sports enthusiasts looking for maximum protection of mobile electronic devices without excessive bulk, LifeProof has a line of waterproof, dirt proof, shock-proof and snow-proof cases. 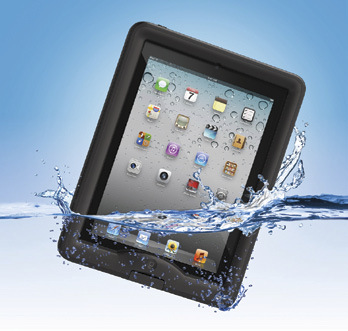 LifeProof cases are available for the Apple iPad Gen 2, 3 and 4, iPad Mini, iPad Air, iPhone 4, 4S, 5, 5C and 5S and iPod Touch Gen 4 and 5, the Samsung Galaxy S3, S4 and S5, and the Motorola G.
LifeProof cases are guaranteed to remain waterproof to 6.5 feet underwater, although they won’t prevent your phone or tablet from heading for Davy Jones’ Locker if it falls overboard. For that, the company offers the LifeJacket. Made of soft, buoyant foam, the form-fitting LifeJacket slips over the case, and its high-visibility orange color makes it easier to spot. And because the skipper probably won’t turn around if you drop your device while rail-texting in the Vineyard Race, a lanyard and wrist strap are included. LifeProof cases come in variety of colors, and accessories including waterproof earphones, solar chargers, connectors, wraps, belt clips, mounts, stands and smartphone camera accessories are available. For more information and to order, visit lifeproof.com.